In the early 2000’s the fashion fad for winter was pure wool sweaters in a myriad of wonderful colors. When the purchasers accidently fulled (shrank) their sweaters in the washing machine, the results—diminished not in color but in size—ended up on the racks of Saver’s, St Vincent’s and Goodwill. I collected as many colors as I could, painstakingly picking out the seams, and washing and drying the pieces. Then I tried to figure out what to do with them. 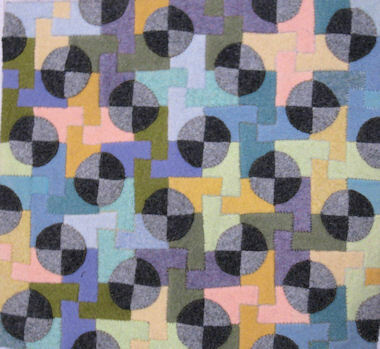 One of my early inspirations came from 19th century penny rugs, characterized by felt circles appliqued onto a background. 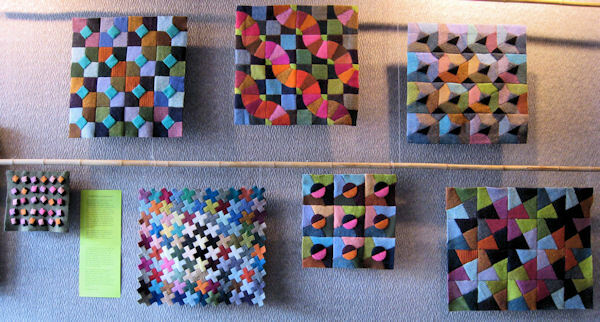 The result was the pieces in the exhibition with circles and squares blanket-stitched onto plaid backgrounds. I also visualized compositions where colored shapes interlocked without a background, but did not know how to put the pieces together. Machine stitching did not please meaesthetically. I settled on cutting the pieces of fulled wool so the edges abutted each other, and hand-stitching them together with crewel wool. Many of these pieces were inspired by basic quilt patterns such as fence rail, taken a step further with appliqued circles and squares (numbers 17 through 21). Numbers 11 and 15 are based on the geometric figure pentomino. This is plane geometric figure made up of five equal squares joined edge to edge. In number 15 each of the colors used is unique, totaling nearly 100 distinct sweater shades. My earlier work in fiber arts also depended on a large collection of colors. I crocheted two-dimensional architectural images using bunches of colors—usually 10 at atime—varying the colors to create subtle gradations. Another experience in fiber arts was as assistant director of the UW Design Gallery where I worked with the Helen Louise Allen Textile Collection to install exhibitions of historical and ethnographic textiles.